LANCASTER – A 46-year-old woman died Friday night after she was hit by a car while crossing a dimly lit street in east Lancaster, authorities said. 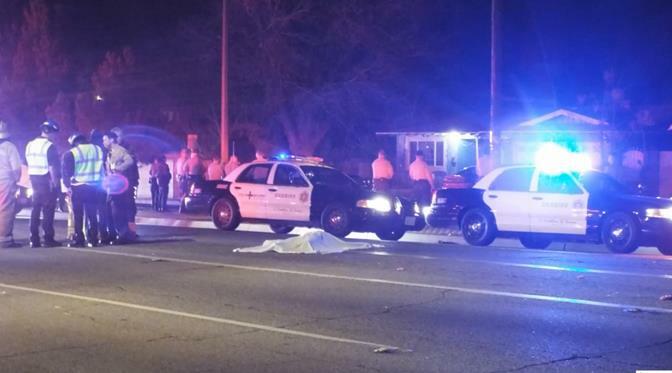 The fatal collision happened around 10:25 p.m. Friday on Avenue J, near Rodin Avenue, according to Sgt. Dave Jennings of the Lancaster Sheriff’s Station. “Preliminary information gathered at the scene revealed the driver of a 1989 Toyota Camry was travelling west on Avenue J in the number one lane at 40-45 miles per hour. The victim was crossing Avenue J northbound, near Rodin Avenue, and was struck by the Camry,” Jennings stated. The driver, a 48-year-old man, stopped immediately and called for emergency services, according to Jennings. “The section of Avenue J where the collision occurred is dimly lit, and the victim was wearing dark clothing. Alcohol does not appear to be a factor in the collision,” Jennings stated. Onlookers at the scene argued with investigators. The onlookers said the car was speeding when it slammed into the victim and threw her at least 50 feet from the point of impact. A cane, that witnesses said belonged to the victim, could be seen wedged between the driver’s side door and side mirror of the vehicle. The victim, whose name was not released pending next of kin notification, was pronounced dead at the scene. Friends at the scene said it was the victim’s birthday and she had been on her way to celebrate. The collision remains under investigation. No arrests have been made in connection with the collision. UPDATED 1/12/14: The victim has been identified as Sandra J. Henderson of Lancaster, according to the Los Angeles County Coroners Office. Henderson had just turned 46 on Friday, Jan. 10, the day of the fatal collision. Henderson was known to friends and loved ones as “Jeannie”. 108 comments for "UPDATED: Woman struck, killed crossing street in Lancaster"
I love and miss you auntie it’s hard without you I hope you would be proud of me because I strive to do better for you! And my mom in heaven give her a hug and a kiss for me and tell uncle I love him as well! Oh and cousin Tyron I can’t wait to hug you again! R.IP JEANNIE COMPTON LOVE. MAY GOD COBTINUE TO BLESS YOUR FAMILY. R.i.p to my auntie…….n anyone with negative comment just remeber everything comes back twice fold and karma is a Biotch …imagine if that was your sister daughter mother auntie cousin or friend …….I say get a law suit on the city to fix that poor lighting ….because if there was light on that street then he most likely would have seen my aunt and stop waaayyy ahead of time PERIOD!!!! Rest in Paradise Jennie I love u!!!! Rest in Paradise Big Homegirl. Auntie Jennie is a great person and always will be. She’s one of the REALIST women I know. We will miss you so much. The Lord loved Ms. Jeannie so much that he took her quickly on her birthday, in the blink of an eye. She probably had no awareness that she was taken. To the survivors, I recommend in her honor, and the driver should be welcomed as a part of this, you do a public campaign to encourage people to use crosswalks, cross safely, and go to the public safety meetings and city council meetings and use this to create change in her honor. It would be easy to start up a Facebook, the local printshops will surely donate fliers, the press will write about what you all work on, etc. This can be done for FREE from a grassroots level and honor her life and help fix something that has been going on way too often in Lancaster. She can be our Angel of the Roads and remind us all to be careful in her honor. Let’s make something beautiful in our community out of her life and the sudden nature of her passing. We can all volunteer to help, somebody just has to be the person to stand up and say: I will start. Who will start this? SO SORRY FOR THE VICTIM AND THE FAMILY WHO IS SUFFERING THERE LOSS MY PRAYERS AND THOUGHTS GO OUT TO YOU GUYS…GOD BLESS YOU AND YOUR LOVED ONE !!! Very well said Only god can judge !!!! you are totally right I so happen to live across from where the accident took place my girl saw the whole thing so that on looker who said the poor victim was thrown 5o feet in the air was a dam lie and the driver was not speeding and he stopped his car instantly and ran up to the woman to try and help her and matter of fact he was the only one out of a few on lookers who ran to her side to try to help as he called for medical assistance!! but my wife said he turned back around in shock and in tears because it was too late she had died instantly…and if you could see the sadness in his face and voice you would already know that this driver had a heart …its sad but he will forever remember miss sandra and have to live with this tragic accident for the rest of his life .and the family has to suffer a tragic loss of there loved one so so so sad! god bless to both familys! Also, look both ways before crossing the street. Please do not jaywalk!!!!! It is amazing this is not an everyday thing in the AV. I feel bad for the driver. Reading all these comments is sad. End of the day, she was jaywalking. She was the one breaking the law. Might not be the thing that friends and family of the victim want to accept, but that is the truth of it. If she would have gone to the cross walk she would still be alive. She is the one that made the choice to cross the street. Sorry, but that’s the truth. Just Sayin, each of us make choices DAILY that if we were given what we deserve, we wouldn’t be here today, so please don’t be too judgmental. We speed, we go through yellow lights, we text and drive, eat, put on make-up, etc., all of which distract us and can put us in harm’s way. You comment is harsh and whether it is true or not, this it NOT the time nor the place to voice it, considering a family has lost a loved one. The last thing they need to see/hear is negativity. The best thing we can do is pray for peace and comfort for the family and friends in their loss. You never know when it’ll be YOUR family and I guarantee you that you won’t just say “well, it is his/her fault because he/she made a wrong choice. Please be compassionate is my plea to you. All I’m gonna say about all of this is I miss my sister with all my heart. For all of you that didn’t know my sister let me break her down to you: The most the wonderful thing about her is he loved the lord with all her heart and didn’t mind professing that to the world. My sister had a heart of gold she loved and she loved hard. Any and every body that came in touch with her loved her dearly. She knew how to treat people with the respect that was given to her, she taught a lot of people about respect and changed a lot of people’s life’s. She was funny and so giving to any body that needed it. These are just some of the basic things about her, if I were to completely tell you about my sister this would be a novel. ‘GOD’ has truly called one of his angels home she’s gonna be missed so very much but….NEVER FORGOTTEN..by everyone. I love you and miss you my little sister Jeannie. I”m sorry for your loss. I have to agree that it seems to be getting worst. nearly every day on my way to work down Ave I at least 2 people on bicycles are riding against the flow of traffic. I have nearly hit someone because they were weaving around on the side of the road. I’m not going to even read the comments, I don’t need them, I have memorise…I LOVE YOU SIS. It is truly very sad for both the victim and her family and the driver and his family. It was a very unfortunate accident so stop blaming and think about what all involved parties are having to deal with, be a little more compassionate for all who are affected by this tragedy. She was both and cool personal friend and Facebook friend to me my prayers goes out to her family. Here is the real. .. AV streets/blocks are long. .. R.X. Paris needs to put more street lights or stop signs. All these people dying from being hit by cars is crazy. Let’s be safe in these streets. R.I.P. you are right AV streets are long. More street lights are needed. Gotta agree,I was on 15th st West today and needed to park across from my destination because of lack of a parking space. The only crosswalks are at Ave J or Lancaster Blvd,so if you are visiting any of the healthcare facilities on that block and you can’t find a parking place you need to do a lot of walking out of your way to get to one. lot of people jaywalking there,including me. That is a long block. Perhaps some money could be diverted from Lancaster Blvd to help correct these problems. Rest In Peace Sis! I Love You, and I’m going to miss you..
Everyone needs to stop pointing blame. Yes JayWalking is illegal, yes so is Speeding. But he wasn’t speeding. The driver did the right thing and stopped and called for help, he could of done what tons of others have been doing and left the scene. Her family will have to live with a missing piece in their lives and the driver will now have to live with the fact he accidently killed someone. The city needs to rethink speed limits and lighting on streets. Hopefully her death will push the city to the right thing and fix the issues. I’m sure had the lighting been better, the driver would of seen her and stopped in time. That was my longtime friend. She was a strong believer in GOD. That’s what I do know. GOD Bless Her Soul. It was avoidable and we can all work to prevent it from happening again. Teach our children how to obey traffic & pedestrian laws, and work with the city for safer streets. My two cents … I’ve killed 3 people before while just doing my job as a locomotive engineer on the railroad. I have to live with that fact every day and trust me I had to face families in court who said ” I was wrong “. Different vehicle I know but in this case it’s simple. No crosswalk equals the victim taking a RISK. The driver could only be cited ( given a ticket ) for speeding IF AND ONLY IF it was determined by law enforcement that he was speeding. It’s that simple. Now he must live his life with this on his mind. Trust me, it will eat that man up and 1000 questions will go through his head. So who truly is the victim here ? The police said the person hit was jaywalking, that’s against the law. Speeding is against the law but only when cought. None of this will bring back a woman who seems to have many loved ones. I’m sure that’s something we can all agree on. This is a sad event in the circle of life for all that are involved. With as many HIT & RUN’s going on these days. I’m glad this driver was responsible and did the right thing. Its actually pretty common with with railroad engineers. You would be surprised the amount of people killed by trains. Some pseudo-hominids cannot fully comprehend compassion and sympathy and need specific laws to tell them right from wrong according to HUMAN behavior. It was an accident, that’s all. No need to assume that the victim was lazy, you don’t rightly know. On Earth, we humans have this unexplainable thing called sapience that connects us to one another to the extent that some of us feel the pain of others. Try to show some respect. GOD Bless this unfortunate person and her family and friends. My condolences to all of those involved in this tragedy. The accidentally loss of human life is a time to mourn. Not to blame the victim. Enough said. The debate about who is to blame was sparked by those that insist the driver should be arrested. How are people gonna blame the driver if alcohol or drugs wasnt a factor and the lady wasn’t visible and she crossing were she not suppose to he is not at fault to many people jay walk they see you coming and still cross in front of you this is s big problem on the east side and at the high schools. Look at the damage to the car. You can clearly see there is no front end damage to the car, there fore she walked into the car. R.I.P. Good point – there was a mini riot at the scene of the incident. I doubt they were seeing things very clearly. They wanted the driver convicted on site. I say again – the fatality was preventable, and avoidable. Teach our children to cross the street safely – MAKE EYE CONTACT with all drivers before stepping out in front of them. Where is “Deputy Dan” in school? Ive almost hit people at 45th and L too….people seriously think that a several hundred pound vehicle can stop for them in the dark in the middle of the street just because they are there. Though the law is on the side of the driver because the victim wasnt in a crosswalk, its still a sad situation all around. The speed should be lowered, and people who want to cross the street need to use the cross walks. It doesnt matter if theyre right or wrong that they can cross in the middle, a car can only stop so fast. The person i almost hit was wearing all black, and ran across from the curb coming so fast i never saw him coming and never expected someone to suddenly be in the middle of the street. Doesnt matter who is right or wrong there, he would have never made it against my van had i not been on it, swerved and been going slow enough. Again though, this is a sad situation and prayers to the family. TO ALL THE PPL WIT NEGATIVE REMARKS N REPYS. U COULD HAVE KEPT ALL THE NEGATIVE STATEMENTS TO YOUR SELVES. SHE US A HUMAN BEING N SOMEONES LOVED ONE. SHE HAS KIDS THAT DNT NEED TO HEAR OR SEE ALL THE NEGATIVE POST PPL R PUTTING. I KNOW U WUR TAUGHT. IF U DNT HAVE NOTHING GOOD TO SAY THEN DONT SAY NOTHING AT ALL. JEANNIE WAS A FRIEND OF MINE N WAS A GOOD PERSON AT HEART. MY HEART TRULY GOES OUT TO HER KIDS N THE REST OF HER FAMILY. INSPITE OF THE SITUATION, SHE IS TRULY IN A BETTER PLACE. SHE HAS NO MORE WORRIES WITH THE WICKED WAYS OF THIS WORLD. GOD BLESS HER FAMULY N GIVE THEM THE STRENGTH THEY NEED TO GET THRU THIS TIME OF GRIEF N DISPARE….ILY JEANNIE N GOD BLESS THE FAMILY!!!! I was driving a few cars behind….the speed limit and lighting should be addressed to the city…..I felt for the family I seen them break down. Its unfortunate that happened. The driver of the car was merely sorry for what happened or else he wouldn’t have called 911……my heart and prayers go out to the family’s…RIP!!! So sorry for your loss, Chappelle. I am truly saddened to hear all you people sit here and judge and assume the worse whether or not it is his fault or her fault we lost a human being she was a daughter a mother a sister a cousin a friend why must we make such a tragedy a debate of who’s fault it was does it really matter to a family or friend it is their lost loved one I ask that you be sensitive to their feelings in their time of grieving it is a loss that is unimaginable May God comfort them and guide them through this tough time. So sorry for this family, I agree with so many of you that our speed limits are way too high in the AV….Please lower them! Some if these commits are ridiculous. While we are now planning a home going regardless as to her age or what was taking place you people are cold hearted and have no right to say that thus is what she deserved. If it was your familly you would feel the same as we do! Please stop committing negatively about someone you do not know! Rest in peace my love! Love always you lil cousin!!! I want to dedicate this to her family she is not seen anymore but she is in your blood sweat and tears. I want to dedicate to her children especially to brian my goddad she may not be seen by you but she is in your blood,sweat,and tears. I want to dedicate this to her children exspecailly to her son my goddad she may not be seen by you but she is always in your blood, sweat, and tears! I hate seeing people blame the victim for Jaywalking…the was not the issue. The issue was that more than likely he was speeding, I know of a case exactly like this one, whoever is next of kin to the victim, I suggest to get a lawyer because there is a case here. I know of a great lawyer who did the case of the same kind of situation and won. His name is F. Kroushan, his office is in Beverly Hills. My condolesense to the family. The speed limit there is 50! Don’t have to speed to do damage. So if the speed limit was 80 mph I still doesn’t make it acceptable to “accidently ” kill a pedestrian. Im from LA where the speed limit is 35 mph, if he was going that speed limit I highly doubt the outcome would of turn out to be the same. When I moved to the AV and came across the speed limit, I really thought it was to high. I truly believe the city should lower their speed limit. Wow you sound like a ambulance chaser handing out business cards for lawyers! If she was not in a cross walk she was jay walking. By putting accidentally in quotes are you saying this was a homicide? 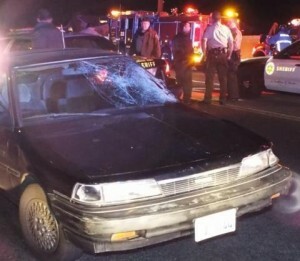 What do you think happens when you hit anything going 50 with a car. Never said it was acceptable how could it be. It was a tragic accident, that is why it is called an accident. It’s not blaming the victim to suggest jaywalking across a dark street where the speed limit is 50 mph is not smart. It’s sad to see, but the driver isn’t really to blame. If crossing out of a cross walk on a dimly lit road the jaywalker holds the greatest responsibility for this accident. It is a great loss but lets be real and not hold the driver responsible when the speed limit on the road is 50 MPH. She chose to cross when I hope she knew it was wrong and she paid the ultimate price. 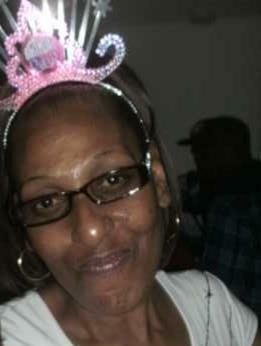 R.I.P Aunty Geenie :-( We Gone Miss You BBY Girl ..
“Gone But NEVER Forgotten” Watch Over Yo Loves Ones!! I’m so sorry for your loss. I understand how u feel. People blaming her for Jaywalking. If a person going the speed limit like the police say, should have time to react or even yet seen the person crossing the steeet. The person whom I knew of the same case was my mom. So I definitely know how emotional this can be for her family. All the best to yall and yalls….. I am really sorry for this lady. My condolences to the family.. R.I.P. Racism over an accident? Really? You are obviously someone who sees it in everything. Too many times I Lancaster I see people crossing a mere 25 yards away from a cross walk. The cross walks are at lights and in well lit areas so people crossing there can be seen and so they can cross when it is safe. Nobody should be going to jail for this because it’s what is called an ‘accident’ not an ‘on purpose.’ By the way there is no such thing as the Anetlope Valley Police. So sad. LASD did a great job handling the situation. I am pretty sure that driver did not intend to hit anyone. Go to jail, that won’t bring her back. It is called an accident for a reason. I hope peace comes to her family. We all need to slow down and really watch for these people crossing when they shouldn’t because this is a nightly happening in that area. Better check the law, the pedestrian does not always have the right of way. If they did, they would not be given tickets for j-walking. You do not get a ticket for doing something right. She wasn’t jwalking while u trying to judge some body that can’t defend for her self you better hope it does not happen to u are anyone in your family. Then why was her sister begging her not to cross the street while on the phone? So sad. She was a nice person and a lot of people will miss her. Worthless people and their worthless comments! Have respect, friends and family of the VICTIM are reading this. Victim is the key word here; no one cares about your opinion on ethics or morals. Shut up and be respectful. I live close to here and have come close to hitting people crossing this street. The lighting is really poor. People really need to wait until its clear especially at night before they try to cross here. It is really difficult to see pedestrians crossing. It is really sad someone was hit. I wonder if the onlookers had a radar gun to see if the Camry was speeding. How fast the car was going is fairly easy to figure out after the fact. At any rate, it’s always unwise to jaywalk in front of a speeding car. Pedestrians don’t always have the right of way. If a cop had seen her, he would have ticketed her. There is a reason for intersections and crosswalks. By that logic a person could run around on the freeway and then blame the driver if hit. Sorry but no, a pedestrian doesn’t always have the right of way. Is it really necessary to show this poor womans body underneath the sheet? Imagine how her family feels seeing this picture. So sad. Her point is that you shouldn’t jay walk especially when you have to walk with a cane and can’t run to the other side of the street when there’s cars coming. Onher way to celebrate that late? Jaywalking when she needs a cane? what the? I have come close to hitting several people on that street. You should not jay walk!!! So sad. 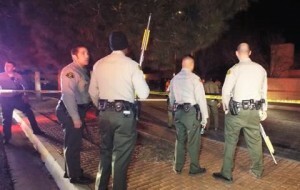 LASD did a great, swift job at dealing with this last night. Like u said you have come close. People shouldn’t jay walk but the drivers handbook clearly state you should scan the road as you are driving. So they both hold fault. What if this was a child running into the street. Would it be his/her fault. We should always look for sudden movements and things of this nature while driving. This is a tragic situation someone will not see their family. Lets stop pointing the finger and pray for the family this victim leaves behind and also the person who has taken a life. He or she has to deal with that for the rest of their life. I came very close to hitting a couple who darted in front of me at 5th East and K. They were coming out of the corner store, and decided to cross about 8 feet from the crosswalk. As I turned right onto Ave K from 5th, there was no way I could have seen them. We all had a green light – had they been in the crosswalk I would have seen them and waited for them to cross. It was nearly a very deadly decision to step out into traffic. Thank God it was daytime and I stopped in time. It was one of those “close calls” that I won’t soon forget.